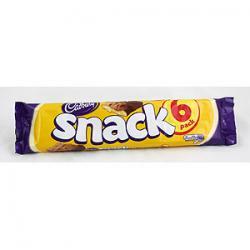 Delicious crunchy shortcake biscuits covered in a creamy layer of Cadbury milk chocolate, this Cadburys Snack Shortcake 6 Pack offers the perfect snack. Shortcake has never tasted so good and thanks to Cadbury we can all enjoy this masterpiece. Buy a Cadburys Snack Shortcake 6 Pack today and you will have a snack you can really get your teeth into.